I’m wearing an odd vest today. Odd because it isn’t a part of my suit and odd because that’s the way that most people see it. Forgive the photo it was taken with the “Photo Booth” feature on my MacBook. The vest is vintage, bought at the Portobello Road Market in London a number of years ago for USD$14. It is a heavyweight wool with plastic-y mother-of-pearl inspired buttons, four slash pockets, and two pleated darts. The label inside reads simply “Weeks of Tenterden.” And it is a very good layering piece on these in-between days (yesterday it was 72ºF, today 52ºF.) The yellow check (in two shades) picks up the yellow in my tie and the yellow overcheck in my blue glen check shirt. The odd vest has a long story, fancy waistcoats turn up in courtly paintings, in photos of members of a certain family at Eton, and on rock and rollers of all stripes. But, the odd vest or waistcoat may be most familiar to us from numerous Tony Randall films, or for the younger generations, the Reese Witherspoon, Ewan McGregor musical “Down With Love.” McGregor sports a nice red one, if I recall correctly. My vest serves two very useful purposes, it adds a layer of warmth, allowing me to doff my jacket at my desk and still stay comfortable without resorting to my cardigan, and it adds four pockets. The pockets can hold keys, a pen, my cell phone and my cards without ruining the line of my suit jacket. And a good line to your suit is one step closer to easy elegance. So, the odd vest, elegant and useful, an easy piece to layer. But yes, it can look a little odd to some folks. Prepare to field a lot of looks and a few questions. It helps to hook a thumb into one of its pockets and rock back on your heels before answering. 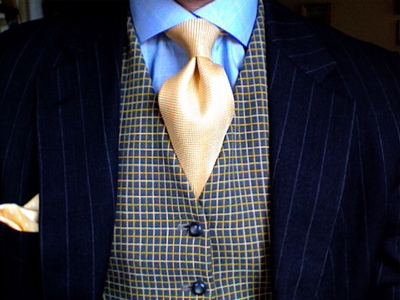 This entry was posted in Elegantology and tagged accessories, clothing, Elegantology, suits, vests. Bookmark the permalink. I think it looks wonderful! Odd- no. Unique- yes, in a fashionable and debonaire way. Do you own any smoking jackets? If so, you must model those for us! I’d love to see more pics of outfits. Thanks Peak! I do have a bottle green, velvet smoking jacket with black, quilted lapels and cuffs. Mrs. E indulged me and bought it from Needless Markup as a wedding gift, ‘lo these ten years gone. I’m afraid that it’s a bit big on me now. But I will off to the tailor and see if we can’t cut it down a bit. I do miss it. Thank you. There are a few scattered around in my previous posts. If I come up with something that suits the topic, I’ll get over the camera-shyness. As I often say, it’s a sad day when a young man wakes to realize that he will never be Cary Grant. Did you see the nytimes style section today? They have an article on vests. http://www.nytimes.com/2008/01/10/fashion/10CODES.html?_r=1&ref=fashion&oref=slogin you may have to register to see this. Also, Style Court’s piece on Jim Thompson was mentioned in the WashPost’s Home section. Thanks Fairfax! No, I missed it for some reason. I’ll click on over. The Post? Man, you all are way out in front! Congrats to all who got mentions. Very suave and debonaire…looks great. Your MacBook Photo Booth seems to take better photos than ours. Beautiful vest. And I like the suit — chalk stripe? I for one would love to see photos of the smoking jacket. I am considering acquiring one for cigar evenings. Thank you LBT. And yes, good eye. It’s a charcoal grey flannel chalkstripe. Three rolls to two button, natural shoulder, reverse pleated trouser (it was off the peg, can’t have everything, but it reminded me of Norman Hilton’s work.) And, it is unfortunately on its last legs after 15 years of hard service. I believe it will be the first suit I have recreated (in a 3 piece model) by my tailors. As long as the dinner suit comes off well. I’ll wear this one around the house or in the garden. The smoking jacket is a good idea for cigar evenings. It really saves you having to air out the dinner jacket for several days. Especially useful “in season” as you will have a number of invitations back-to-back. I’ll play around with the camera next week. Good to hear. If I may ask, who is the maker? I have an old Southwick suit in a navy chalk stripe. The jacket is a natural-shouldered, dartless 2-button (sack); the trousers are plain front w/cuffs. It too is on its last legs and I am considering a local craftsman to recreate it. I have already inquired with one tailor and he was bewildered by the lack of darts on the jacket! Not a propitious start to my venture, to say the least. I would love to know how YOUR project turns out! I’m not sure who made it. We were using Peerless from Canada at the time. Norman Hilton also did some designs for us (I think that Peerless produced them, too.) I know it’s not a Southwick. My tailors (plural because it is an MTM company) default to dartless, believe it or not. I had to ask for darts on the dinner jacket (I doubt I am as thin as you.) I have high hopes for the project. WIll Dynend told me that I may be luckier with a true MTM company rather than an itinerant tailor. (And the wear that I’ve seen on some collars around here may prove him right.) I’ll keep everyone posted. Incidentally, reading your profile at Adr. Cod., you weren’t that nice Canadian gentleman who got me out of Ivory Coast in ’89 when more… diplomatic methods failed, were you? Sounds as if you have some great tailors! I was considering taking my suit to MyTailor.com / Hemrajani, whose US office is nearby, to see if they could replicate it. I recall Will said some positive things about their shirts. I’m cautious about a suit though. That wasn’t me in the Ivory Coast. What were you up to there? I was in Southern Africa: Zimbabwe, Namibia, Botswana, South Africa. I got into a spot of trouble with the Mugabe gov’t in Zimbabwe in 2000 and had to leave. Horrible people. I’m watching South Africa these days. One of the hedge funds I work with invests heavily in Africa, and the gentleman who runs it has mentioned he’s heard plans are afoot here & there to force a regime change in SA should the ANC gov’t start targeting foreign firms and landowners. Things could get messy. Africa is such a beautiful place, it’s a shame Africans are so rotten to one another. Hmm, that’s the trouble with an untested tailor. Any luck with the guys on London Lounge for advice? I know there are a few HK’ers on StyleForum and AAC who may have used him for suits. I was visiting a friend in Cameroon — Peace Corps type. Most of the tour was in the bush. Thank God for the Guinness truck which always got through when nothing else would. Routed through the airport in Côte d’Voire and ran into some trouble with the local shakedown artists … I mean National Guard or whatever. Third time I went through the metal detectors, the alarm went off. Got strip searched, three days not being able to leave the airport, out of cash and no one took cards. Couldn’t get word to the consulate or my friends at State. The gentleman I met bribed a couple of guards and got me out on the tarmac with instructions to keep going no matter what. Only a round or two fired into the air and I made it into the plane and home…. yikes. Oh for a dip passport. Yes, Africa is beautiful. I’d like a more luxurious tour next time. A vested interest here ! I own a vintage vest, a yellow wool tattersall, and a belgian linen one – and a pocket watch is mandatory. As the article mentioned above in The NYT points out, the wristwatch helped to kill off the vest. And I’m with the author who muses that there should be an iFob. I do own a couple of pocket watches, but rarely bring them out… partially because one sports a fob of a high degree Mason (a relative), and I feel a fraud wearing it. I do like to wear one in a breast pocket on my tweed jacket and run the fob through the buttonhole, though. He specialized in double-breasted waistcoats. Do admit, a grand idea! TW– a double breasted dove grey waistcoat is a very elegant addition to a charcoal chalkstriped suit. (Although it can appear costume-y and so should be worn as the only accent piece by those who are less sartorially secure.) Keep trying to commission one! I think I shall. You are right about the questions part: Yesterday I went to a party, wearing a blue spread collar shirt , a red ascot as a tie, grey trousers a buff cotton waistcoat and blue odd jacket. Maybe I’m too young for the look (23) but many made jokes about me looking like a waiter. I suppose it is because only few (if any) are used to seeing a waistcoat nowdays. Bafe, at 23 I bet your peers aren’t used to seeing anyone not wearing shorts and flip-flops. Straight class right there. Looks like a half windsor with a dimple? I was actually just playing around with mine, trying to get that tight bottom on the loop. I love it popped against the odd vest and pinstripe! Some great ideas to take away. Thank you Lincoln. You’re correct about the knot, although I usually wear a four-in-hand. Keep fighting the good fight and thanks for reading.